June 26th every year is marked as the International Day in Support of Victims of Torture. 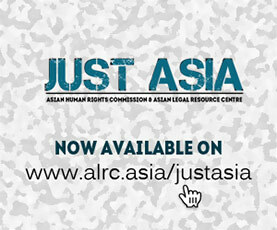 The Asian Human Rights Commission (AHRC) works closely with victims of torture through its network of partner organisations across the countries it works in. In India, the bulwark of AHRC’s work in the prevention of torture has been through its partner grassroots organisations – Nervazhi Human Rights Protection Council (Thrissur, Kerala), MASUM (West Bengal), Human Rights Alert (Manipur) and People’s Watch (Madurai, Tamil Nadu). The relentless work done by these organisations on the ground have helped expose state crime and custodial violence and the continuing use of torture by state authorities. The work of AHRC and these organisations through the years has shown that torture is usually and frequently used as tools of investigation, retribution and punishment by state authorities. The use of torture is implicitly and explicitly allowed, even promoted, by the state, as well as by the public. The notion that accused persons and criminals ‘deserve’ to be subject to violence extends to treatment meted out to people of different vulnerable groups and identities. This results in torture affecting those that wield the least power the most. In Kerala, there have been several cases of torture that has come to light recently. The most prominent is the 2017 case of a young Dalit boy, Vinayakan, who committed suicide after being tortured in custody, ostensibly for his ‘funky’ hairstyle, profiled as someone with criminal tendencies. 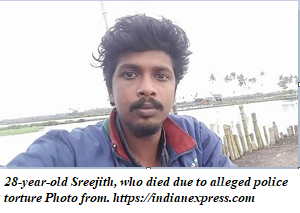 Recently, another young man Sreejith died in hospital, once again due to confirmed police torture, and allegedly the fifth person due to die in custody, since May 2016. Nervazhi has documented other cases of torture that do not make the headlines or national news. There has been very little headway in any of these cases on the direction of ensuring that the guilty officers are punished, under the Indian Penal Code and other criminal laws, for crimes they have committed. In West Bengal, MASUM frequently files complaints with the National Human Rights Commission (NHRC) regarding cases of torture by Border Security Force (BSF) officials and police officers against villagers living in border villages, along with allegations of corruption and an abject failure to follow due process. It is extremely difficult to ensure justice for these victims of torture as it is highly improbable that BSF officials or Army officials will be prosecuted for these crimes. The dogged and courageous work of grassroots organisations like MASUM helps keep alive the fight against torture and the fight for robust accountability mechanisms. The widespread use of torture and the extremely low conviction rate of state officials accused of torture shows that police reforms in India is a failed project, and the slew of measures that the Prakash Singh case mandated have either been diluted in states, such as in Kerala, or completely absent, like in many other states. India needs effective and reliable mechanisms that will ensure justice for victims of torture and this June 26, AHRC renews its call to the Indian State to make justice for victims of torture a reality, through the enactment of robust accountability mechanisms to ensure that state actors that torture, are punished. This is crucial and urgent to reduce impunity and tackle the normalization of the use of violence within the criminal justice system. Finally, the Indian state must enact a legislation outlawing torture and ratify the UN Convention against Torture.